A wafer, God’s sake. 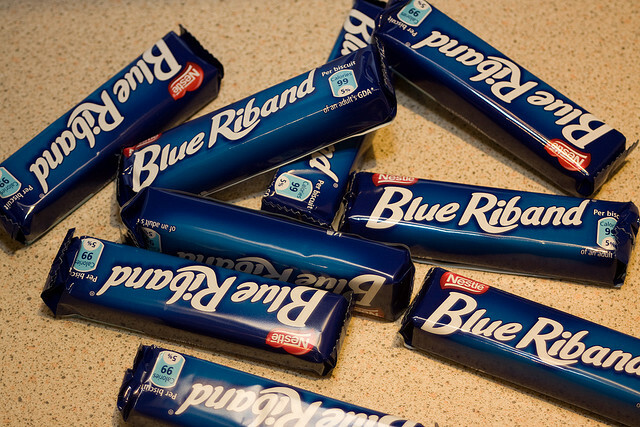 For some obscure reason, the shockingly awful song “Blue Riband Blues” is stuck in my head today. This song, sung by Mike Berry in the 1980s’ commercial, advertised Blue Riband biscuits – lightweight chocolate-covered wafers that were “the very thing”, as my late Granny used to say, to have with a wee cuppa tea. I remember a few arguments between family members as to how to pronounce it: Rib-and or Rib-and. I still don’t know where to put the stress – answers to the usual address. Actually, I hated the advert back in the day but I was a big fan of the biscuits. Well, that is until someone close to me at the time derided Blue Riband as “working class biscuits”. My dad, who loved the ad and the biscuits, refused to call them anything other than “working class biscuits” thereafter, much to the embarrassment of said friend, who was continually offered those biscuits when visiting my house. Mike Berry was a bit of a pop star in the 1960s but is probably far better known as Mr Spooner from Are You Being Served? Appropriately enough, when Berry left the series, the story went that Mr Spooner was leaving Grace Bros to be a pop star. Well, the next time I remember seeing him was ululating, Damien Rice-style, in a tune-free dirge about his wife failing to provide him with a Blue Riband with his tea. Does this make Mike Berry a working class hero? No. This entry was posted on January 31, 2012 at 12:52 pm and is filed under Food & Drink, Music, Pointless Nostalgia, TV. You can follow any responses to this entry through the RSS 2.0 feed. You can leave a response, or trackback from your own site.